BARGAIN DECORATING WITH LAURIE: WILL SNOWMEN MELT IN THE SUNROOM? WILL SNOWMEN MELT IN THE SUNROOM? Don't you just love Tuesdays, when Susan hosts Tablescape Tuesday, and aren't you glad that Thanksgiving is finally gone, so I'll stop posting Thanksgiving tablescapes? Now, you'll be seeing Christmas tablescapes on my blog. Don't worry, it's not much longer until Christmas will be here. (Oops! I guess that IS reason to worry!) I don't think I'm going to be ready, but maybe my tables will, thanks to Tablescape Tuesday! If you've visited my blog before, you know I have a few collections. Okay, you can stop laughing. Yes, I have a LOT of collections! You just thought you had reason to believe that I am crazy, and you had not even seen my Christmas collections yet! For the Christmas season, my sunroom is filled with my collection of snowmen, so the table setting in this room is -- you guessed it -- a snowman theme. I used a quilt for my tablecloth. I saw this top hat on Pat's blog (Back Porch Musings) (Between Pat's blog and Susan's blog, I have a lot of porches on this blog--maybe I should call this room a sun porch instead of sunroom). Well, I wanted one of those cute top hats so badly that I paid full price for it! I can't remember the last time I paid full price for anything! (I've been looking for a sale on plastic surgeons-have you seen any sales?) When I brought the top hat home and placed it on my table (it began to dance around -- sorry), I couldn't figure out what to put it in. You see, Pat had made her's look so pretty that anything I did paled in comparison, so I'm still working on that hat. My sister gave me this cute stemware for Christmas a number of years ago. I've had the place card holders so long, I can't remember where I got them, but I'm sure they were a bargain! If you've visited my blog before, you may remember that I often use napkins or paper plates under a glass plate, because it is an inexpensive way to make my dinnerware go with my theme. The plates with the plaid border were a pattern that was being discontinued at a local gift store, so being the bargain hunter that I am, when I spotted them on the sale table, I knew I had to buy them. The mittens, which hold the napkins and silverware, are a Christmas tree decoration. I bought all that were left in the store when I found them for 25 cents each after Christmas one year (I can't pass up a bargain, even if I don't know how in the world I'm going to use it). See, the string that goes over a tree branch is under the plate. More of my snowmen follow. There are so many of them, I tried to combine some pictures, with the hopes that you might not get tired of looking at all of my snowmen. If you really want to see them, just click on them to enlarge. I don't know what these snowmen are doing during the "off season", but they do seem to multiply each year. Do you think they are mating in that closet where I store them? Can anybody tell me how to distinguish between a snowman and a snowgirl? I could at least store them in separate boxes next year. I used a Christmas tree skirt as a table topper. See that darling lamp (the snowman in a jar)? I ordered that from Lynne's shop. Okay, I'm starting to figure this reproduction thing out (you'd think after having two children, I would already know all about the birds and the bees). In the next picture, on the right side of the table, there is a snowman that looks like a candle. It's a lamp that I also ordered from Lynne's shop. Lynne, are you sending me pregnant snowmen (ahem, snowgirls)? You know, it's kind of hard to tell if a snow person is pregnant. Whew, this posting is getting long. Sorry, but I don't want any of these snow people to fee left out when I'm taking pictures. I just have one more thing to share, and it is much more fun than my snowmen (or snowgirls), at least for me it is. 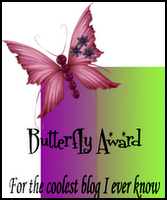 Bridget at My Silly Blog has honored me with the Butterfly Award. Bridget has such a great blog that it makes this award even more of an honor. IMHO, this award has a lot going for it. First: It says it's for having a "cool" blog. I have always wanted to have ANYTHING that is cool, but I've always been kind of a nerd and haven't had or done anything very cool. So I am really honored to accept this award! Second: It doesn't require me to do a whole lot (You may have noticed that I don't follow instructions very well). One reason I have trouble with award instructions is that I always have to pick other blogs to pass the award on to. I think every blog I visit is cool (that's one reason I wanted mine to be cool), AND, it always seems that whomever I send it to has already received it. If you don't have this award, I am now presenting it to you, because every blogger who visits my blog has a really cool blog, so please copy the award picture and then if you can find 10 bloggers who haven't received it, please pass it on to them. Sorry Bridget. I just can't follow rules, but thank you so much for following the rules and passing this award on to me! I adore that top hat! Where do I get one of my own? I must have missed the one on Back porch Musing. I think your Aaah, Hmmm, chubby snow people are cute. I love d Christmas pictures. It reminded me of our own Christmas which we celebrated long ago in 1986. That was in Chico, CA (I was a student then). Christmas tree and all d ornaments ... Now I live in Malaysia and I don't celebrate Christmas anymore. That room is just wonderful. I love the quilt on the table and that top hat is the perfect centerpiece! I would have snatched up those plaid dishes, too. I love patterned rims with solid centers like that. You can do so much with them. I think you did a great job on your sunroom. All the snowmen are soooo great. You are so cleaver with the title...are they melting? You have the coolest blog today! Snowmen! What great ideas, love the mittens for the siverware, the plates are great! I will take that quilt off your cool hands today! The is warming the porch up! Oh and that top hat! Reminder to me I want a top hat! You know I never seen a top hat in a store, now just where in Arkansas do I need to come. lol I have snowmen placemats and snowmen I use after Christmas, for its a winter wonderland theme. Now when you are tired of it just pass it over the Mississippi River,maybe it will ice and the snowmen can slide over on the quilt, or I will come flying. I love everything you've done here and I love the falling snow. Great! Oh Laurie, I read so many things in your post that made me say "me too!" I never thought to use a tree-topper as a table toppper though. I have a couple of vintage ones that I never know what to do with...now I do! I've said it before but I'll say it again...I LOVE your sunroom! Oh Laurie, where do I begin....I love your table and everything on it, but as you told me about my beach Santa (and I followed your advice by the way - so thanks! ), you should tell people to enlarge that 1st tree photo. That snowman garland has my heart...I've never seen anything like it - it is soooooo cute! Love it all...wish I could see it in person. And oh by the way, you're no nerd - you're cool - I just know it! Really like your window treatments and the wreaths on the doors look great. Your tree topper looks marvelous, can't imagine where you found it. The placement of your tophat is perfect. It looks like a cake stand. A very good way to elevate the centerpiece. I see good taste runs in your family. Your sister made an excellent choice. I consider your use of a "paper" plate underneath clear glass ingenious. You can have any type setting you want with just a quick change. Much less hassle to store, unlike the snowpeople collection. And they won't multiply on you either. Morning, Laurie! Oh, my goodness! Your sunporch is adorable with all of your snowman pieces! Love the top hat in the middle of the table! You have so many wonderful things - could I come shop at your house? Hi Laurie...Your sunroom made me say "WOW" when I clicked on...not only is it gorgeous but with the snow effect it is even more so. OK, now I've got to buy some clear glass plates & copy your idea of decorative paper plates underneath. ...that would solve a lot of storage issues. Loved every photo in this post...keep 'em coming! Hey sister! I share your love of collecting and I loooooooove snowmen! I think they are multiplying as well!! Everything is so festive and fun! I love how you used the mittens too! Thank you so much for the award as well!! You are hilarious, girl! I laughed out loud at your comments about finding a plastic surgeon on sale, the top hat dancing around and the pregnant snowgirl....too funny! Love your snowman themed sun-porch! Very cute! Lots of fun ideas for the table...I need to show my daughter (who turns 30 on Saturday...now how did THAT happen??? )as she loves to do a snowman theme as well! Thanks for the morning chuckle! !Your writing is so entertaining! And your tablescape! WOW! A feast for the eyes!! Love it ALL!! What a great idea to use clear plates over paper plate!! and the mitten silverware holder, the painted glasses--I could go on and on..but must run (hobble) to Physical Therapy now. Love the mittens and the quilt and the stemware and all the precious snowmen! I also loved the snow falling in your pictures! How cool is that!? I enjoyed every single picture of your wonderful snowman (snow people) collection. You've really inspired me to get off my duff today and finish things up around here! I love your idea of using clear plates with napkins underneath...believe me, I'll now be on the look out for some clear plates! The mittens as silverware holders...adorable! Laurie, how cute. what a great idea with the snowmen...and that quilt! Oh my could it get any cuter than that? Hey is it snowing there? It is 70 here, would love to see some snowflakes....real ones! Have a lovely day....your post is just beautiful! I am just so happy looking at all your snowmen. You did make a beautiful tablescape. What fun it is to see your huge snowman collection! I just started collecting snowmen last year as a remembrance of my brother. I have about 16 or so. Darling! The snowman theme is just darling, especially with small children. Love the tartan plaid plates! HOLY BAT CRAP...IT'S A BLOOMIN HERD OF SNOWMEN! I don't think I've ever seen that many adorable snowmen in one room! That is an amazing collection...I can't even imagine how long it takes to get that all together! I have been looking for the birth control for a lot of items. Put them in boxes, closets, hutches...those buggers come out with more that look very similar to them! Your snowmans are all adorable. Laurie, I enjoyed your tablescapes! I love your idea of using clear plates over your paper plates. I've never seen this before. Ohhhhhhhhhhh...I love the snowmen...and the tablescape done with them!!! So pretty. **Have you ever thought of using a smaller font on your blog? It's kind of hard to read so big. well, that tablescape is just darling. No wonder you loved the top hat--how cute! Everything is so festive from the goblets to the mittens. So, so cute! I am so happy to see someone else use their quilt for a tablecloth! My husband thinks I've flipped my lid when I do it! LOL! LOVE THAT HAT!! Happy Tuesday! Laurie, you are so clever, girl! What a great idea about the glass plates over the paper ones! I think you need to send that idea into Sandra Lee! She use it in a heartbeat. 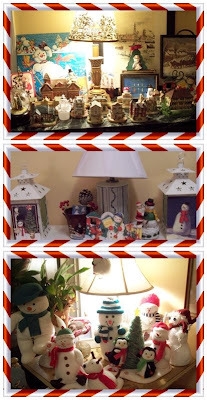 Love all your snowmen and Lynne's lamps are awesome! I adore the silverware holder/mittens idea...so cute! Oh I just loved this post Laurie!! Everything is sooooo cute, whimsical, fun, AND pretty!! I LOVE all the snowmen :-)...but I think what I like most of all is the decorative top hat centerpiece!! What an original and fun idea! Wow! I love your creativity and fun sense of style! So stinking cute! Love it! What a great collection you have and the top hat! Too clever. Your Snowman sun room is great,you have so many nice snowmen things.The top hat is just the coolest idea,and I love your quilt on the table.Everything looks so nice and inviting, awesome job. What a great room! Love it! You have such a fabulous collection. That hat is just the best touch! WOW!! Girl.. I see you've had quite a few visitors..if you need the elves..I'd be more than happy to send them your way...are you all cold down there? It is frigid up here...hope all is well.. I've missed you sweet lady. I'm glad I'm not the only one who's shopped at a hospital gift shop. LOL! Girlfriend...I don't know how I missed your "Snowmen in the Sunroom" post...sheeeshh!!! But know that I'm here...I just have to tell you that your Snowman Sunroom is my most favorite Christmas room ever...yes, and I mean EVER!!! It has become my "all time favorite"!!! Of course I have a thing for snowmen..hehe!!! 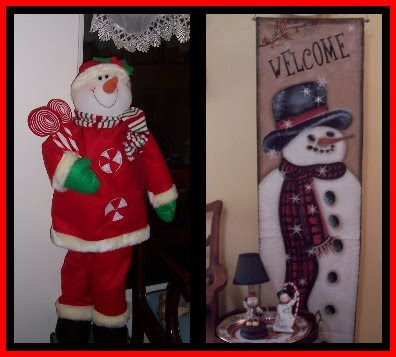 I could do my entire home in snowmen...all year long...and be soooo happy!!! Don't know for sure what it is about the little guys and gals...but I just love em'!!! Your sunroom is absolutely gorgeous...so much fun and so whimsical...I love everything about it!!! Honestly, I think that it should be showcased in every famour Christmas publication!!! I just love that you used that pretty Christmas quilt as your table covering...what a grand idea!!! And I love your tablescape...You're such a talented lady!!! Well...I must mention that I savored each and every photo...enjoying every little snowman!!! You should really consider putting this room on RMS and micasa...it just needs to be shared with everybody!!! WOW..WOW...WOW!!! Well I guess by now you can tell that I'm in love with this room...hehe!!! It really has become my very favorite Christmas room EVER!! !